Ernest Jackson thinks kids in trouble can be helped. He has helped children throughout the Toledo Public Schools and elsewhere, giving them the confidence they need to succeed. Jackson’s lesson: “Control is Power – I am the boss of my behavior.” He teaches them to recognize their own value and self-worth. 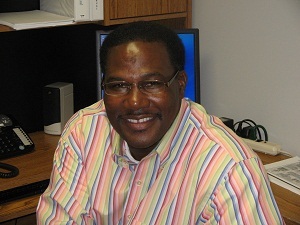 Jackson is a native Toledoan with a long history of social service, church ministry, and youth counseling. Now, with the help of SCORE, he is expanding his outreach in the community by making himself available to other schools, businesses and organizations, where his motivational message is applicable in many personal situations. Jackson met SCORE counselor John Bodner, purely by chance, at Sanger Branch Library a few months ago. As a result, Jackson says, “SCORE brought my dreams of having a business into reality.” He now has a non-profit LLC called NU Day Empowerment, designed to bring together his various activities, which include writing children’s books. With a non-profit able to raise money, Jackson is funding bus passes for kids living outside of the two-mile mandatory school busing area, but who have difficulty getting to school on their own. It is simple things like this, he believes, that make a difference in whether a child succeeds or fails. According to Ernest Jackson, John Bodner and SCORE made it happen with him, just as he is trying to “make it happen” with others.